Enepro Xicato is the next generation member of the Enepro downlighter family utilizing Xicato technology renowned for its industry leading colour consistency. 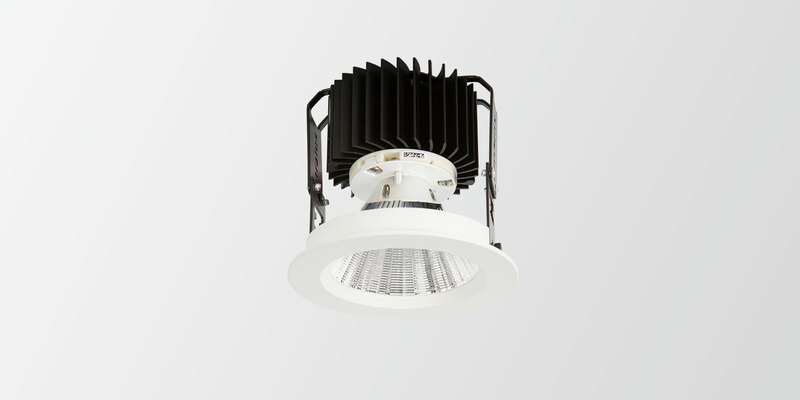 The Xicato module is the only LED with a 5 year warranty on Colour Consistency & Lumen Maintenance. Enepro Xicato is a high performance downlight designed with a deep recessed engine for minimal glare. Enepro X-XS is a high performance ‘pocked rocket’ downlight with up to 1170 fixture lumens yet a small fixture profile has been achieved without compromising the thermal management. Enepro X-XL is a larger style, high performance downlight with a luminous output of up to 4100 fixture lumens. Features: • 2 x Fixture designs: Fixed and Adjustable • Adjustability of 25 degrees in the Adjustable model to offer ultimate design flexibility • Two fixture footprints available – XS: Small Diameter of upto 26.9W XL: Large Diameter of upto 46.8W • All LED modules are within 1×2 step MacAdam ellipse. • The fixtures have been thermally validated by Xicato for upto 40°c ambient unlike the industry norm of 25°c • All Enepro Xicatos’ are designed with a deep recessed LED engine for minimal glare • A mixture of optics options including reflectors in both specular and faceted along with Lenses. • Amazing Colour Rendering Index of 83 – 98. There are currently 4 LED specifications to choose from: • Standard – CRI 83 provides light that is functional and superior to ceramic metal halide and fluorescent lamps. • Vibrant – CRI 83 – brings out vivid, saturated colors and the details of texture for compelling and eye-catching visuals that capture and hold consumers’ attention. • Beauty – CRI 95 – offers high ‘R9’ Value to deliver extraordinary clarity and fidelity with a warm, flattering ambiance. • Artist – CRI 98 – is virtually indistinguishable from halogen-based light and gives Artist Series light an even richer feel compared to other sources. • Available in IP20 • Product life span exceeding 50,000 hours at L80 • Designed with a purpose engineered heat sink to ensure the operating temperature is kept within the design parameters of the LED unit, even at 40ºc ambient. • Fully photometered to LM79 • Australian Designed & Manufactured • Intralux Australia offers a 5 year product warranty on the Enepro Xicato downlight. • Xicato offers a “5 year Colour Consistency amd Lumen Maintenance Warranty” on all thermally validated Xicato luminaires.